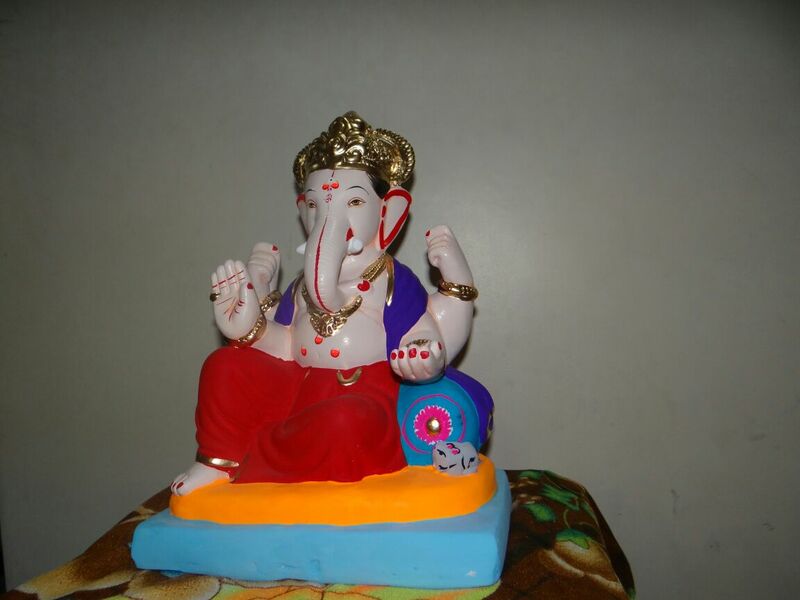 We want to encourage eco-friendly activities by promoting clay idols to reduce pollution cause by plaster of paris idols with chemical and synthetic paints and more importantly the idols which are worshiped with so much devotion should be properly immersed. 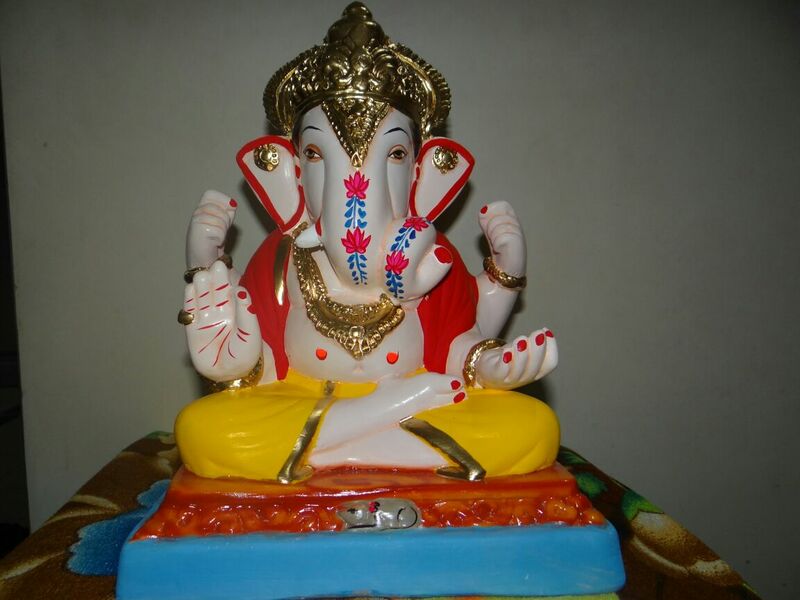 Ganesh made out of clay easily dissolves in water and will not break in to pieces. It’s very sad sight post immersions at riverside piece are visible at river- bed. 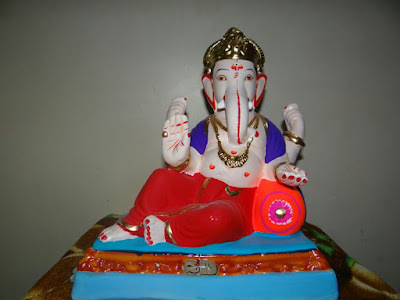 During Independence struggle When India was against British –Shri Lokmanya Balagangadhar Tilak started Sarvajanik Ganesh Festival to bring people together, a necessary collective platform to fight freedom movement which was otherwise restricted by British. But today we are facing another hazard challenge to save Earth from pollution. Hazardous material and industrial waste has already polluted our river. These harmful dangers will continue to cause great damage to environment. People purchase pop idols because they are cheaper and more easily available in the market. 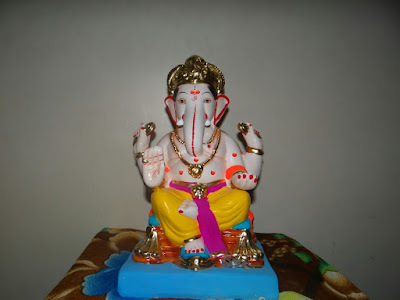 These idols do not dissolve in water easily. 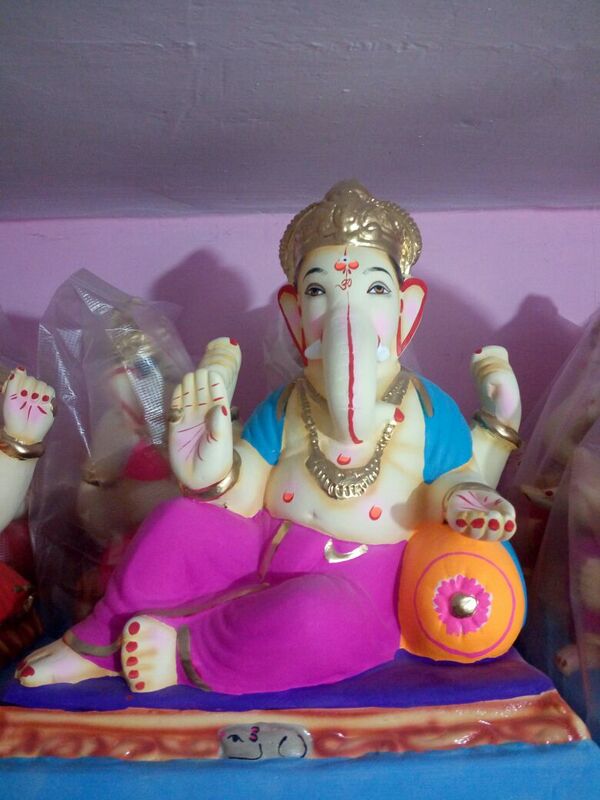 We have Ganesha idols of many shapes, colors and sizes, individually crafted by craftsmen of Pen. Shadu is a kind of clay found in the river bank, mostly in the konkan region of Marashtra.A traditional medium of making ganesh idols, shadu clay is an Eco friendly way of making ganesh idols .Shadu idols were worshipped in Maharashtra since centuries and these are still artists who only make shadu idols since it is entirely made of natural clay .Shadu does not add to the pollution of the water.Shadu idols are the fastest idols to dissolves in the water compared to paper Mache and pop idols. They are made from natural material hence do not harm to aquatic life. 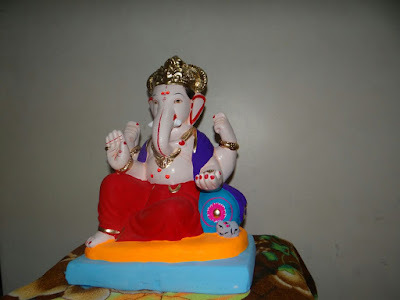 Ganesh Chaturthi is celebration are traditionally held on the fourth day of the first fort night(shukla chaturthi) in the month of Bhaadrapada in the Hindu calendar usually August or September. 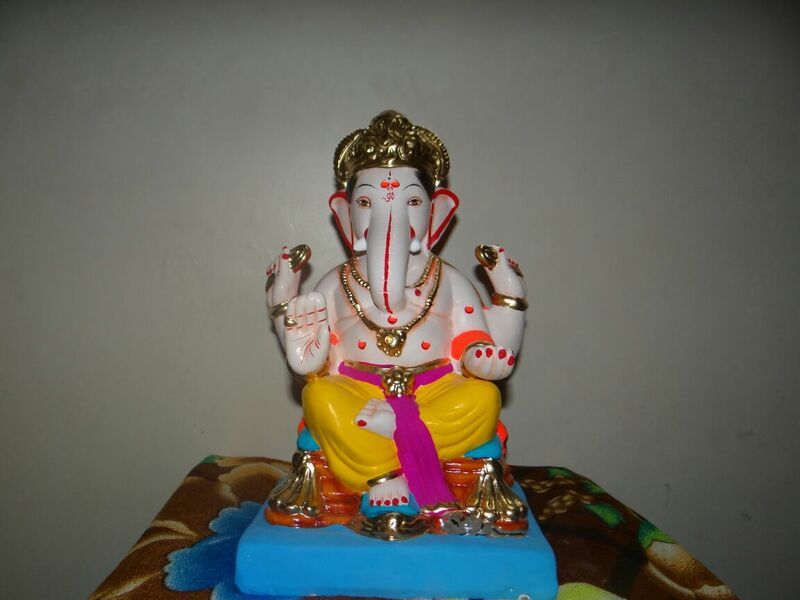 In the consecration ceremony priest performance a Prana Pratishta to invite Ganesh to the idoil. This is followed by the 16 Step Shodashopachara ritual during which coconut, jiggery, modak, durva ( Grass) & red flowers are offered to the murti. Throughout the ceremony hymns from the Rigveda & the Ganesh Stotra (ds and family, typically in the morning and evening. Traditionally, idols were sculpted from mud taken from nearby bodies of water; after the festival they were returned to their source, a cycle meant to represent the natural cycle of creation and dissolution. The term 'mod' means happiness, joy or bliss (Ananda) and 'ka' means part of. 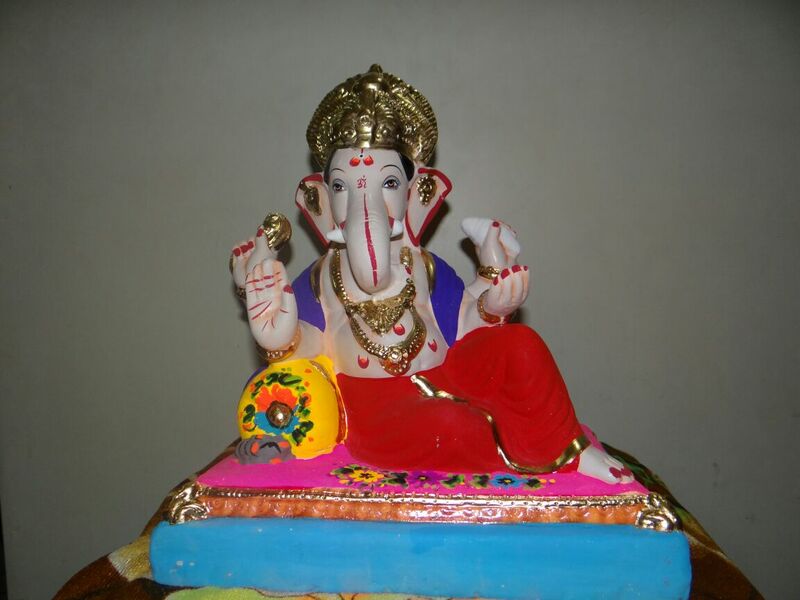 Hence, anyone who is joy loving is liked and blessed by Ganesha. Thus modaka becomes a small part of bliss. A modaks are shaped like coconuts. Their cavities are filled with delicacies and nutritious dry nuts. These Modaks are a symbol of spiritual knowledge (meditation or Dhyan). Hence these are also called Dyanmodaks. In other words, the Modaks abode knowledge and bliss. The worshipper is endowed with these virtues by making heartfelt offering of Modaks. Due to which the devotees are blessed with peace & Prosperity. Today we are facing hazard challenge to save Earth from pollution. Hazardous material and industrial waste has already polluted our river. These harmful dangers will continue to cause great damage to environment.